This offer is a little bit involved, but if you’re planning on spending £120 in the cinema before 31 July 2015 (and possibly for a year longer if you get a gift card), this could be a pretty good deal for you! Your initial outlay is £70, but you’ll get £33 back from selling the phone (plus you get a month of Vodafone usage too), making the final cost just £37. I’ve bought the Nokia Asha 210 Black, because it’s the cheapest phone that fits the criteria for the deal (smartphone costing over £50). You need to make sure to buy the £20 “Freedom Freebie” with your phone to get the offer, and it doesn’t seem to be working online, so you might need to go into store to get your phone. 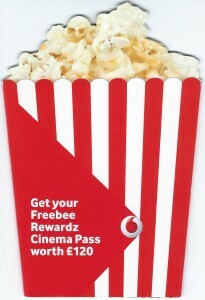 You should receive your special “Freedom Freebie” voucher and a popcorn shaped brochure containing a special code which you’ll need to pop into the Vodafone site to activate your offer. You need to activate your SIM with the “Freedom Freebie” code enclosed in the pack in order to be eligible for the free cinema vouchers. Inside the popcorn brochure (pictured), you’ll find a scratch-off card. Go to the site on the card, enter your code and details about your phone (I think you’re meant to use the phone number of the SIM included). You’ll be texted a link which you need to click to activate your account, so make sure you have it handy. You’ll want to grab the IMEI number off the phone before you sell it – you need to enter this into the site to activate your cinema credit. I’ve sold my Nokia Asha 210 to CEX for £33, which works out to a £17 loss (which you’ll make back on your cinema vouchers, of course!). They provide a prepaid label, so you can just drop it in at the Post Office, and that’s insured up to £20 when you get a free proof of posting. You need to claim £10 credit each month. It’s not yet clear how this process will work, but it states that you’ll just have to log in to the website each month. If you don’t claim the credit in any given month, you’ll lose the opportunity to claim that month’s £10. Unused credit should accrue and must be used by 31 July 2015, at which point it’ll expire. It appears that you’ll get a prepaid Visa card with your balance loaded that you can use at any cinema in the United Kingdom. There doesn’t appear to be any restrictions on what you can buy within the cinema (not that they could find out, since it goes through the Visa processing network). It’s not yet clear whether you can redeem your voucher online. If you’re getting close to 31 July 2015, and you’ve got credit left, you can probably just buy a prepaid gift card from the cinema of your choice to extend the life of your balance. Plus, you’ll probably be able to register your card with Quidco if you’re spending in Cineworld to get an additional 3% cashback. Make sure you read their terms and conditions – this is based on my reading of it. 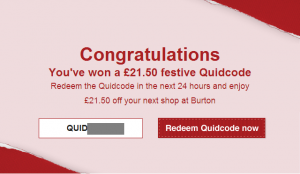 Quidco are currently doing a daily promotion where you can be awarded a “festive Quidcode”, which gives you an additional bonus cashback on top of the current rates. I’ve won £21.50 off Burton today, although everyone else I’ve spoken to who’s tried it so far hasn’t been successful yet… but there’s still quite a few days to go in this promotion. There isn’t currently much info available on the Quidco site about it (doesn’t seem to be mentioned in their blog), but keep clicking the button each day to enter the draw – you’ll instantly find out if you’ve won. Edit: According to the Terms and Conditions, you can enter every day until the 12th. Note that if you win, you’ve only got 24 hours to redeem your prize (you need to copy down your Quidcode and enter it onto the retailer’s page, then click through to the retailers site), so make sure you act fast. You’ll also need to spend a minimum of the value of the Quidcode to get the full amount credited to your account as cashback. Not a Quidco member? Sign up here and we’ll split the £10 referral bonus when you earn £5, so you’ll get a bonus £5 once you’ve hit that threshold!